DETROIT -- When FCA US abandoned mainstream compact and midsize sedans in 2016 to focus its limited resources on more profitable utility vehicles and pickups, analysts viewed the shift from cars as risky. But the redesigned 2019 Ram 1500 -- bowing Monday at the Detroit auto show -- appears to be a major beneficiary of the strategy, sporting a long list of engineering, safety, performance and functional improvements. The Ram pickup is the automaker's best-selling vehicle in the United States and Canada. It’s the second-best selling truck in Canada, behind the F series and the third-best-selling vehicle in the United States behind the Ford F series and Chevrolet Silverado. Even as it nears the end of its current product cycle, the outgoing Ram managed to chalk up a U.S. sales gain in 2017, topping 500,000 for the first time ever, including the decades when the Ram was part of the Dodge brand. FCA sold 98,465 Rams in Canada in 2017, up from the 89,666 it sold the year before. The redesigned Ram 1500 goes into production this month -- along with the previous model, which will continue to be produced for up to a year. Chevrolet plans a major redesign of the Silverado that is also on display in Detroit and will hit showrooms in the fall. 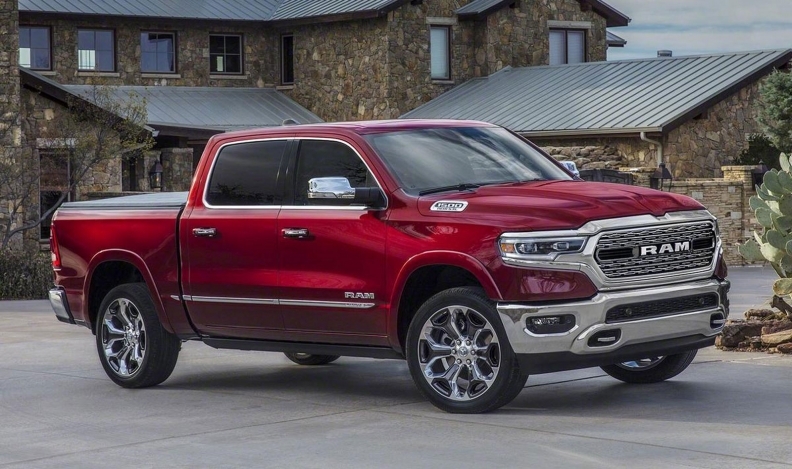 The 2019 Ram 1500 is bigger than the previous model, with overall length growing by 23 centimetres (nine inches), including 10 additional centimetres (four inches) to the cab. The added cab space enables the second-row seats to recline up to eight degrees. The redesigned pickup is also stronger than the previous version. The frame is made of 98 percent high-strength steel. Also, a new eTorque mild-hybrid system increases torque by 90 pound-feet on the 3.6-litre V-6 engine, and by 130 pound-feet on the 5.7-litre V-8 engine. The eight-speed automatic transmission has also been improved. Maximum payload increases to 1,000 kilograms (2,200 pounds) and maximum trailer towing to 5,760 kilograms (12,700 pounds). The 2019 Ram also boasts increased efficiency. A belt-drive generator and 48-volt battery are standard, as are short-term torque assist and regenerative braking. Drag coefficient improves to .357, with active grille shutters, raised bed rails, an air dam and air suspension contributing to a more aerodynamic ride. Fuel economy numbers were not yet available, however, and FCA has not yet indicated whether it will keep its 3.0-litre EcoDiesel engine as an option for the 2019 pickup. 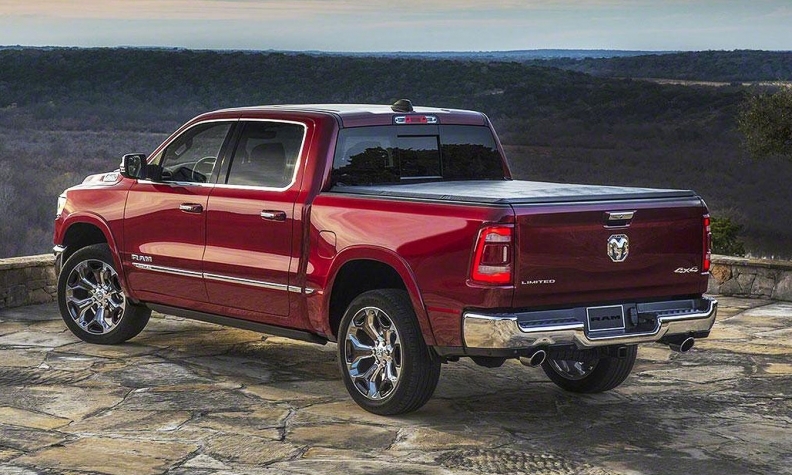 Even though it is longer, wider and taller than the previous Ram 1500, engineers were able to trim nearly 102 kilograms (225 pounds) from the latest model. Inside the cabin, legroom is increased in the first and second rows, while the reclining second-row seating has new folding center armrests. A new 12-inch infotainment touch screen dominates the instrument panel, with split-screen capabilities allowing simultaneous operation of up to two functions, such as the climate controls and navigation. A bird's-eye camera system eases parking, and the pickup gets Sirius XM's new 360L service that allows individualized streaming for subscribers. A 19-speaker, 900-watt Harman Kardon audio system with repositioned door speakers to improve sound quality is optional. Interior storage space is greatly expanded, including a larger reconfigurable center console that can be transformed into 12 storage combinations. The optional RamBox bed storage boxes include a three-prong 115-volt plug. The 2019 Ram 1500 will continue to be powered by the 305-hp 3.6-litre V6 engine or an optional 5.7-litre Hemi V-8. But engineers were able to quiet the cabin in the V-8 model by employing frame-mounted "active tuned mass modules," which work electronically to dampen engine noise in the cabin, reducing cabin noise to 67 decibels. Both engines are paired with an updated version of its eight-speed automatic transmission. In terms of safety, Ram incorporated new wheel blockers into its frame across all trim levels to improve performance in slight offset frontal crash tests. In addition to expected electronic safety features such as automatic braking and adaptive cruise control, the Ram 1500 will have available adaptive front lighting that illuminates up to an additional 15 degrees in the direction of travel. Pricing has not been announced. Production of vehicles for sale will begin this month. The previous-generation 2018 Ram 1500 will remain in production for "at least a year," FCA CEO Sergio Marchionne said in October, in part to help guard the new pickup's residual values.